45" (L) X WIDTH 59 1/2" (W). ADVANCE (NYC) SUBWAY POSTER FOR THE MOVIE. MICHAEL BECK, JAMES REMAR, DORSEY WRIGHT. A " RE-PRINT " OR A " REPRODUCTION " OR A " PRINT ". THIS IS AN ORIGINAL SUBWAY POSTER PRODUCED BY AND DISTRIBUTED BY THE STUDIO TO BE GLUED AND HUNG ON THE NYC SUBWAY WALLS. NOTE: THIS POSTER WAS NEVER USED FOR ITS INTENDED PURPOSE, THUS IT HAS NO GLUE OR TAPE ON THE POSTER. THERE IS UN-NOTICEABLE LIGHT CREASES IN TOP BORDER AREA. NO PIN HOLES IN CORNERS. NO TAPE OR TAPE MARKS. MINOR EDGE WEAR AT TOP; NOT NOTICEABLE. TOP RIGHT CORNER AREA APX. 5" LENGTH AND 3" IN FROM EDGE LIGHT CREASES (SECOND IMAGE). AT LOWER LEFT CORNER APX. 3" X 3"(THIRD IMAGE) CREASES AT TIP. NOTE: UNLESS OTHERWISE STATED, THESE ARE ORIGINALS. THIS MATERIAL WAS USED FOR MARKETING PURPOSES. DUE TO THE FACT THAT THESE MATERIALS ARE OLD AND CAME TO US VIA THE STUDIOS, OR OTHER SOURCES INVOLVED WITH THE FILM INDUSTRY, THEY ARE NOT EXPECTED TO BE IN ABSOLUTE MINT/UNUSED CONDITION. ANY GLARE SEEN IN THE IMAGE IS DUE TO THE CAMERA ANGLE AND NOT A DEFECT IN THE POSTER. TO THOSE READING OUR POSTINGS, WE SELL ONLY ORIGINAL MOVIE POSTERS & MOVIE RELATED MATERIAL. WE WILL NEVER SELL REPRODUCTIONS OR FAKES. WITH SIGNATURE CONFIRMATION UNLESS OTHERWISE REQUESTED INTERNATIONAL. 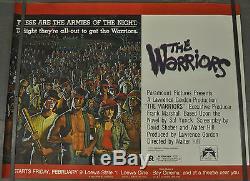 The item "THE WARRIORS 1979 ORIGINAL ROLLED SUBWAY MOVIE POSTER 45X60 MICHAEL BECK" is in sale since Monday, March 06, 2017. This item is in the category "Entertainment Memorabilia\Movie Memorabilia\Posters\Originals-United States\1970-79". The seller is "legendmovieposters" and is located in Rutherford, New Jersey.